It was early 2001. Style.com had recently launched and I was enjoying my newfound discovery while pouring over the Fall collections. It was also the time when Marc Jacobs launched his Marc by Marc line, which would become quite an obsession for the next few years. I was going away to college in the Fall and I wanted to be just as cool as the girls on the runway. 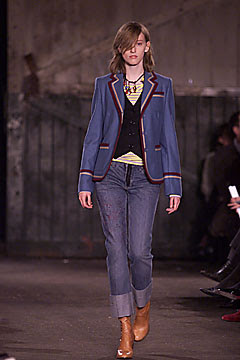 I fell in love with this particular blue jacket and when Fall came around, the jacket was all over the pages of Teen Vogue and Elle Girl (remember Elle Girl?). 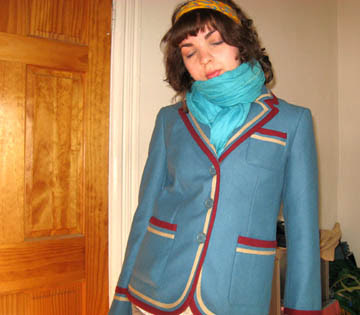 Of course, as a freshman attending design school, all my money went to art supplies and the jacket was completely out of my budget. A few months later, I finally joined Ebay and thought, "hey, maybe one day, someone will list that jacket and it will finally be mine". Cut to seven years later, and lo and behold, the jacket is finally mine. MINE! Thanks Ebay. You're the best ever. Congrats1 It looks much better on you than it does on the model...! I am so psyched about this that I almost slept in it when it came in the mail. Then I realized that was a crazy thing to do. you look so commmmfy and chic!